CHANNING – Noah Olgren and Ozzy Corp hit home runs and Connor Hanlon twirled a one-hit complete game to power the Ishpeming Blue Storm to a 6-2 victory over the Copper Country Flames in the opening round of the Mid-Peninsula League American Legion baseball playoffs in Channing on Tuesday evening. Ishpeming advances to the semifinals to play the league champion Marquette Blues at 5 p.m. EDT back in Channing. In Tuesday’s other game, Gladstone defeated Channing 6-4 as the Indians face No. 2 seeded Kingsford in today’s other game at 7 p.m. EDT. Today’s winners square off for the league championship at 6 p.m. Thursday. The Blue Storm, which compiled a 3-3 league record and earned the No. 5 seed for the tourney, jumped out with three runs in the top of the first inning against No. 4 CC. 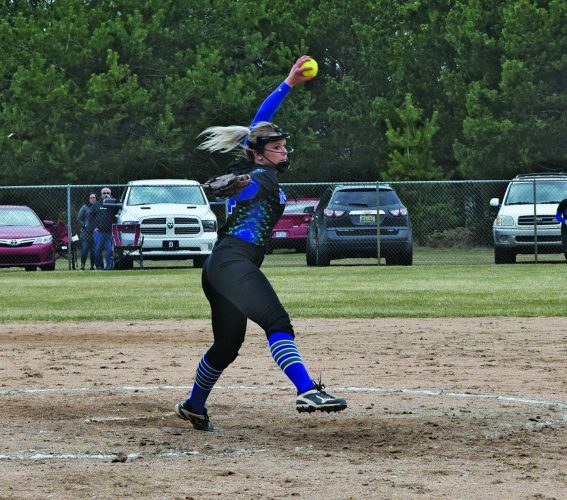 “The team finally started hitting the ball and we also played a good game defensively,” Ishpeming assistant coach Ron Hanlon said. Olgren opened the scoring with his solo homer before Ishpeming put men on first and second to set up an infield RBI hit by Wyatt Bodette that brought in another run on a throwing error. The Flames got a run back in the bottom of the inning on a walk and error but the Storm upped its lead with Corp’s own solo shot over the fence in the fifth and two more in the top of the sixth highlighted by Cedric Nora’s RBI double. CC collected its only hit in the bottom of the sixth when a grounder hugged the third-base line and helped produce another run. Hanlon struck out two and walked two in his seven innings of work as Olgren and Nora both finished with two hits which included a fourth-inning double by Nora.